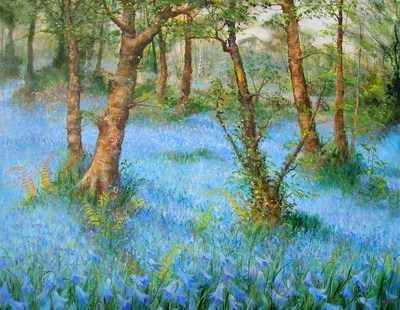 HIGH PRESTIGE EXHIBITION STANDARD LARGE OIL PAINTING "Bluebell Heaven" . BY THE FABULOUS ARTIST DAVID ALDUS. This lovely large painting uses oils ever more transparently and turned to an evocation of almost pure light by use of shimmering colour!! ......Painted deep in Buckinghamshire woods! Highest price received for one of his paintings is £14,000. "Lot's Wife" Absolute investment opportunity!